PLEASANT RIDGE RIDERS SNOWMOBILE CLUB RIDE - Caswell, to the Blue Moose in Littleton. All interested riders please be at the clubhouse at 9 a.m.
EASTER CRAFT DAY - St. Francis Community Center, 1-3 p.m., sponsored by Friends of St. Francis. JUNIOR SKI INVITATIONAL - Fort Kent, Lonesome Pine Trails. 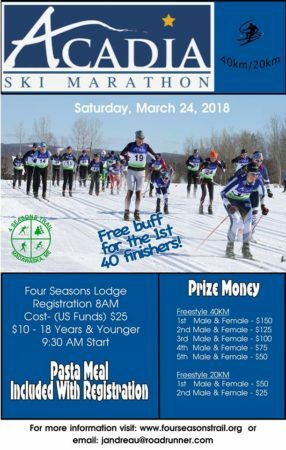 20 km and 40 km ski race at the Four Seasons Lodge Saturday, March 24. Registration 8 am: Race begins 9:30am. Cost (includes pasta meal): $25; 18yo & younger $10 Prizes for top finishers and free buff for first 40 finishers.